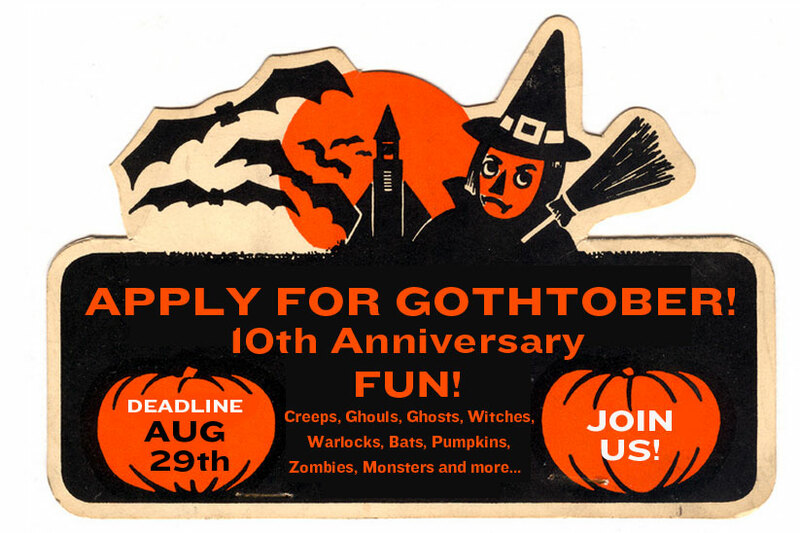 Gothtober’s crooked moon approaches and we want you to be in the pumpkin patch for our 10th Anniversary! APPLICATIONS DUE AUGUST 29th, 2012 • Participants will be notified of admission by September 6th at the latest. Upon acceptance, a $25 registration fee is required. 2.) The Theme is “10” a.) The number 10 in some way (10 items on screen, 10 tips for severing fingers, 10 recipes, 10 sounds, just… 10, y’know? b.) OR you can ignore the “10” theme and make your piece all spooky, creepy, crazy, weirdy, autumny, candy, fun and freaky Halloween theme like the original Gothtober from 2003. There will be a lot of pumpkins in Gothtober’s design this year, so also… if you want to have your piece involve America’s favorite round orange squash, knock yourself out! 5.) 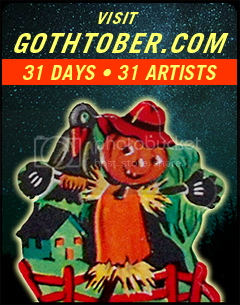 And of course… if you want to gain inspiration from Gothtober itself, visit GOTHTOBER!